CMA CGM has started to upgrade its Asia-West Africa ASAF fleet by replacing the 4,200-5,800 teu vessels with a series of 9,000 teu-plus ships. According to Alphaliner data, the 9,365 teu CMA CGM Danube was phased into the ASAF service on 28 December while the 10,034 teu CMA CGM Columbia joined the loop on 16 January. 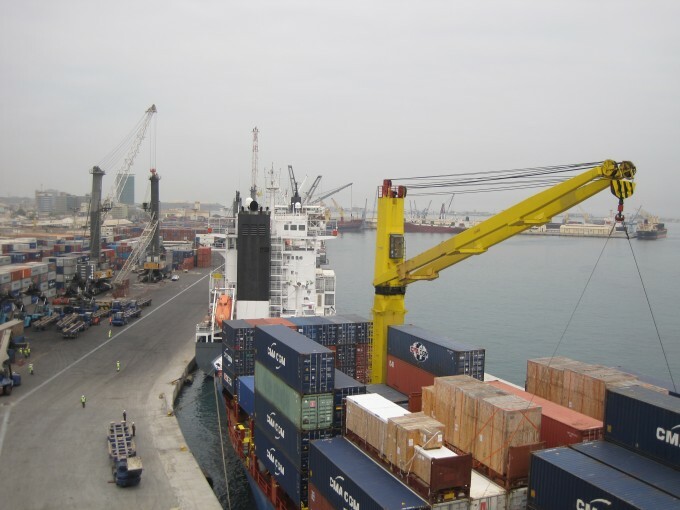 As well as Cape Town, the ASAF calls weekly at the West African ports of Walvis Bay (Namibia), Pointe-Noire (Republic of Congo) and Luanda (Angola), deploying 13 vessels on a 13-week turn. The ships hub at Pointe-Noire for cargo relays to other West African ports, such as Lagos and Tema, but even for the calls at Walvis Bay and Luanda facilities will be “stretched”, said Alphaliner, and containers will need to be discharged and loaded by mobile cranes. MSC was the first carrier to introduce post-panamax tonnage to the African market when it deployed an 8,500 teu vessel to its Africa Express Service in January 2015 via a hub-and-spoke operation at Lome. Since then MSC has continued to deploy bigger ships between Asia and Africa, setting the bar higher again last week with the departure from China of the 11,660 teu MSC Francesca. Carriers are keen to deploy the biggest-possible ships on secondary trades, due to the cascade of displaced tonnage from Asia-Europe following the flood of ultra-large container vessel deliveries last year. However, despite the lower unit costs of larger ships, container lines run the risk of destroying markets by using vessels that are far too big for the current demand, while the requirement to fill extra slots exerts downward pressure on freight rates. According to Drewry, today’s spot rate of approximately $2,800 per 40ft between Asia and West Africa compares with around $4,500 per 40ft in early 2014 – and further declines are expected. In addition, the dramatic drop in oil prices has badly hit the economies of West African nations such as Nigeria that depend heavily on oil exports; while commodity prices for iron ore, copper, rubber and cotton have also tanked in the past year, denting investment plans and consumer spending power. So it is not difficult to see why the trade has hit the buffers. The economic downturn is also a major factor in the congestion that blights West African ports as hard-up governments are unable to invest in improving infrastructure. Chronic traffic congestion outside ports almost entirely dependent on road transport, and an erratic supply of electricity are the biggest obstacles for the West African container supply chain. Olaf Merk, administrator ports and shipping at the OECD, has described West African port facilities as “probably the least efficient of all global terminals”.